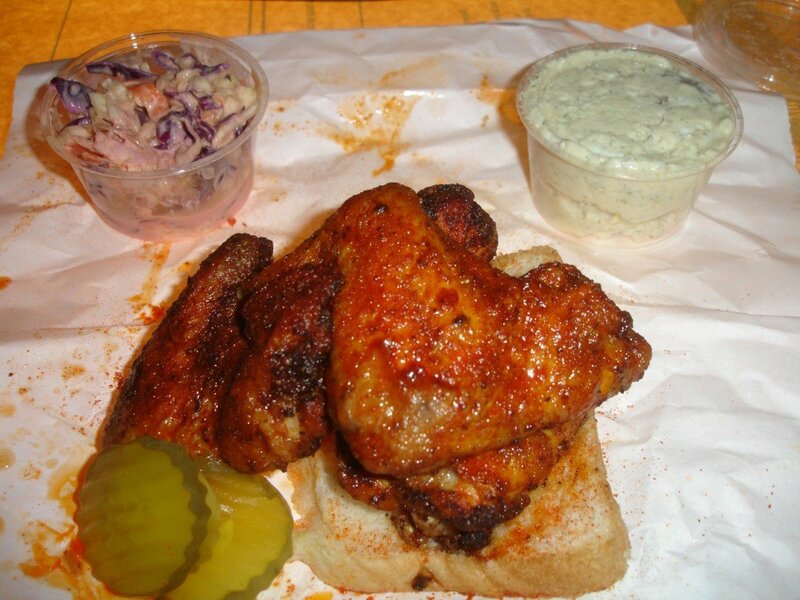 So I was right, I attempted poorly to bypass Cackalack’s Hot Chicken Shack to try another cart this evening. I failed. I thought I’d try a standard dish, so I tried the wings. Hot. Potato salad. I should note–I hate potato salad. I also hate coleslaw. I wound up getting both I was so confident that I’d like it based on the quality I experienced so far. I’ll start with the chicken. Spicy hot in a dangerously delicious way. The meat fell off the bone and resigned to the vacuum which was my mouth. At the end I was left with fire in my mouth and a couple of pickles and bread to cool me down. I immediately grabbed the potato salad. UNbelievable. The typical ‘deli’ taste not there. Just a lightly sweet melange of creamy potato, egg, and a slight crunch what was either celery or onion. It didn’t last 45 seconds. I hate coleslaw more than potato salad. As a matter of fact, I’ve only found maybe 2-3 servings in my entire life which I’ve found to be even remotely palatable. Two of those servings were at Macadam’s Bar & Grill and I don’t think it is technically even coleslaw as it is called ‘pear slaw’. Cack’s slaw was absolutely yummy. Not too creamy, lightly reminiscent of the flavor of the spices that are used in the chicken (which easily might have been transferred from my upper lip) and superbly cooling from the last bits of heat that were still on my tongue. All this for a super reasonable price and ultra-friendly service and conversation. If you haven’t been there yet, you can check out their website here. Thanks Jeff! That was killer! Happy to! I love that this neighborhood finally got a pod that I can almost roll out of bed and land on. Good stuff!